There are plenty of books that tell the soldier’s story and take the reader beyond media accounts by showing the human face of war. However, there are few books that go beyond the soldier’s story. That is not to say the soldier’s story is not inspiring. However, these are times that clamor not only for soldiers but for heroes. People need stories of moral leadership from those who can get things done on any field of battle. 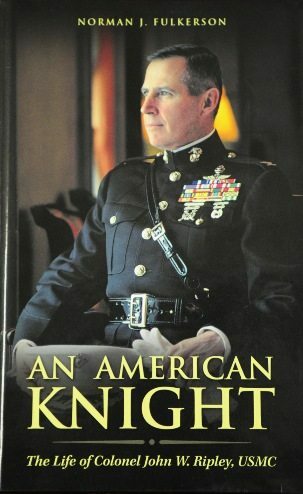 An American Knight: The Life of Colonel John W. Ripley, USMC is one such story. Author Norman J. Fulkerson has written a riveting cradle-to-grave biography of Col. John W. Ripley that engages, inspires and motivates. In his warm and appealing style, Mr. Fulkerson not only tells of a true Marine legend of the Vietnam era, he tells the story of an American knight. 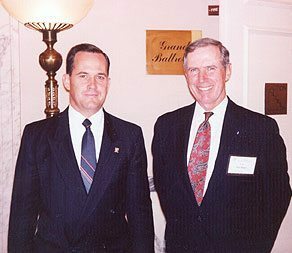 Norman Fulkerson with Col. Ripley in Washington, DC. At first glance, this portrayal might seem difficult. Knights are supposed to be riding white horses and wearing shining armor not combat fatigues. Knights usually aren’t Americans since they belong to times past. Yet Mr. Fulkerson seems to relish the paradox as he tells his story. Indeed, Col. Ripley was an archetypal American. His upbringing in a small town America is all apple pie. One is treated to accounts of his mischievous “Huckleberry Finn” childhood adventures that warm the heart with a glimpse of those simpler “cracker barrel” times. John Ripley’s story starts like that of so many other energetic youth who lived on the wild side of things during the fifties. And it may well have ended there. But then, suddenly we see a change in John Ripley. He comes to represent another no less archetypal American – that heroic American with a can-do attitude, relentless drive and solid patriotism. One sees him join the Marines, enter the U.S. Naval Academy, and deploy in distant Vietnam where he became a living legend. Here the archetypal American meets the knight. One can definitely see the knight in the feats of Col. Ripley. He is more famously known for his heroic action in Vietnam during the Easter Offensive of 1972, where he faced down over 30,000 North Vietnamese and 200 enemy tanks. 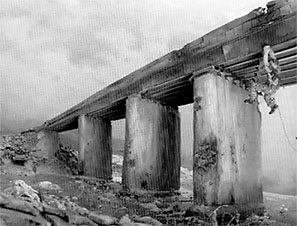 Praying to God for help, Ripley proceeded to blow up the Dong Ha Bridge, preventing the enemy from crossing. As stunning as the Dong Ha story is, there are only a few chapters dedicated to this feat. It is obvious however, that Mr. Fulkerson is not just telling the story of a Marine legend; he is telling the story of a real knight. Capt. John W. Ripley under heavy enemy fire, chants “Jesus, Mary, get me there! Jesus, Mary, get me there” as he crawls hand over hand to set explosives to blow up the Dong Ha bridge. Knights do more than just fight battles. They fight that most important of all struggles: the battle against themselves. With unshakable faith in God, they overcome their defects and vices and present a role model of spotless character to a society in need of them. 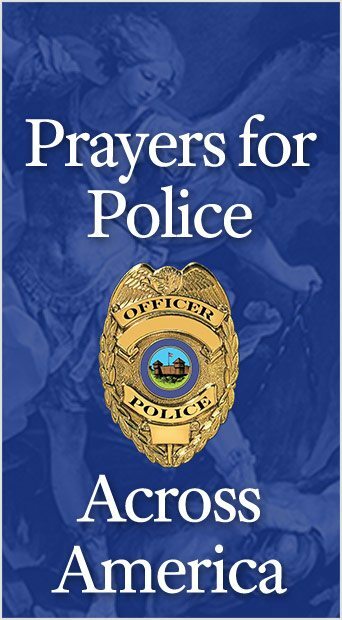 They go beyond the call of duty and sacrifice themselves for the common good on any battlefield. They live up to a code of chivalry that our permissive society believes impossible to follow. And thus, Mr. Fulkerson presents Col. Ripley as a true knight. Inside the pages of his book, one finds the devout manly Catholic, the faithful husband, the loving father, and the Southern gentleman. One sees the commander, the warrior and leader. There is also the administrator, scholar and mentor. There is one field of battle where Col. Ripley excelled and that was the field of public opinion. This knight was not afraid to voice his opinions even when they went against the “politically correct” opinion of the times. When testifying before Congress, he did not waver in expressing his opposition to homosexuality in the military and women in combat. Such moral battles are often more terrible than those of the physical battlefield! Thus, Mr. Fulkerson presents a figure who is both American and knight. He proves that such a portrayal need not be a paradox. It should rather be a model. An American Knight is an inspiring story but it is also a challenge. In these times of political correctness, it challenges all Americans to have the moral courage of someone who stands firm. When so many wilt and waver, it calls upon all to find and look to an uncommon human type – the knight – for the kind of moral leadership needed to weather the storms ahead. This entry was posted in TFP Recommends Books and tagged 1972, American, American Society for the Defense of Tradition Family Property (TFP), Analogous, battlefield, colonel, combat, Congress, Dong Ha Bridge, Easter Offensive, elite, gentleman, hardbound, heroic, homosexuality, Huckleberry Finn, John W. Ripley, Knight, military, nobility, Norman J. Fulkerson, opposition, Southern, Traditional, United States Marine Corp, USMC, Vietnam, women by John Horvat II. Bookmark the permalink.